Fol. 280 nn. Bll. (Rom. Typ., 2 Kol., 49 Zeilen Min. f. Init. ), Blindgepr. gotischer Ldr.-Bd. d. Zt. a. 3 Bünden. Frühe und seltene Ausgabe dieses erstmals 1459 bei Fust in Mainz erschienenen Werkes. - Der französische Kanoniker Guillelmus Duranti (1237-1296) schrieb seinen liturgischen Traktat in Italien vor 1286. Das in zahlr. Handschriften und Inkunabeln überlieferte Werk zählt zu den wichtigen Quellen für die Kenntnis der westlichen Liturgie. Zur Bedeutung innerhalb des kanonischen Rechts vgl. Schulte, Lit. d. kanon. Rechts II, 144ff. - Einband beschabt, etw. bestoßen u. mit einigen Wurmspuren. Rücken u. Vorderdeckel m. Nummernschildchen. Schnitt m. alter Titelbeschriftung. Alte Besitzvermerke a. Innendeckel u. den ersten beiden Bll. Unterschiedlich gebräunt bzw. fleckig (Ränder tlw. etw. stärker). Tlw. Wurmspuren. Die letzten Bll. etw. feuchtrandig, dadurch wenige Bll. m. kl. Läsuren bzw. Fehlstellen im weißen Rand. Rückendeckel m. Resten einer zeitgen. Halterung für eine Kette, dadurch die letzten Bll. im oberen weißen Rand m. kl. Rostspuren. - GW 09119 Hain 6481 Goff D 419 Rhodes, Treviso 38 IGI 3628 Pellechet 4500 BSB-Ink D-337 Proctor 6471 Madsen 1469 BMC VI, 887 ISTC id00419000. Mare Clausum seu De Dominio Maris Libri Duo. Mit 2 gestochenen Karten und 2 Holzschnittafeln sowie einigen Textholzschnitten. Der Titel lautet weiter: Primo, Mare, ex Iure Naturae, seu Gentium, omnium hominum non esse Commune, sed Dominii privati, seu Proprietatis capax, paiter ac Tellurem, esse demonstratur. Secundo, Serenissimum Magnae Britanniae Regem Maris circumflui, ut individuae atque perpetuae Imperii Britannici appendicis, Dominum esse, asseritur. - Pergamentband der Zeit. - STC 22175.7 Kat. Kammergericht Berlin S. 1459. - Zweite Ausgabe der berühmten Schrift, die EA war 1635 in London erschienen. Schon 1618 hatte Selden das Essay wohl niedergeschrieben, anlässlich der Konferenz zwischen Holland und England, an der auch Grotius teilnahm. Da James I. aber tief in der Schuld des dänischen Königs stand, erhielt Selden keine Erlaubnis zur Veröffentlichung. Erst 1635, auf Wunsch Charles I, nahm Selden die Arbeit am Mare Clausum wieder auf und veröffentlichte das Werk. Charles I. was so pleased by Seldens performance that, by an order of the privy counsil, it was directed that one copy should be kept in the archives of the council, another in the court of exchequer, and a third in the court of the Admiralty (DNB). Zustand: Vorderdeckel etwas aufgebogen, etwas angestaubt und fleckig. Innen: Titel mehrfach alt gestempelt, vorderer fliegender Vorsatz mit kleinem Randausriss, leicht stockfleckig und gebräunt. 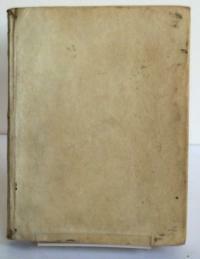 - Second edition of the famous work, bound in contemporary vellum. ANTONINUS Florentinus, S. (Frate Antonio Pierozzi, O.P., 1389-1459). Butricis Papiensis impressa, 1459. ANTONINUS Florentinus, S. (Frate Antonio Pierozzi, O.P., 1389 - 1459). Venetiis, Anno dni. 1492 die 23 zenaro. In - 4° (mm 200 x 150), cartonatura settecentesca. (100) ff. (manca a1 col titolo) segn. a10, b18, m10, 2 coll., 43 ll. Car. gotico. Alcune postille a penna di antica mano. Esemplare ben conservato. L' autore frate domenicano, casuista e cronista, fu dal 1445 Arcivescovo di Firenze, canonizzato nel 1523. Edizione molto rara (2 sole copie in U.S.A.). H.(C) 1200a. Reichling, fasc. IV, p. 112 - 13. Proctor, 5359 A. B.M.C. V, p. 502 (copia mancante del titolo e di altri 2 ff.). G.W., 2133. I.G.I., 649. Goff, A - 826. Psalterium Benedictinum Bursfeldense (GWM 36286, H 13480). Seitenfragment 75b und 76a. PRIMA PARS SUM[M]E FR[AT]RIS ANTHONINI DE FLORENTIA: ORDINIS PREDICATORUM & ARCHIEP[ISCOP]I FLORENTINI. In qua agitur de a[n]i[m]a & de pertinentibus ad ipsam. Incipit proemium totius operis. Testo latino. Cm.27,7x18,6. Carte 240 non numerate, la prima bianca., presente nel nostro esemplare. Legatura in piena pergamena rigida con titoli manoscritti, sbiaditi, al dorso. Tagli spruzzati. Testo su due colonne, in carattere gotico. Spazi bianchi per iniziali con lettera guida. Restauri con listelli cartacei all'incipit e all'ultima carta. Alcune chiose quattrocentesche. Al verso della penultima carta il colophon: "?Hic finis prime partis Sume Anthonini [....] Impressionique dedite venetijs per Leonardum Wild de Ratisbona. M.cccc.lxxxi...?. Alcuni forellini all'ultima carta, contenente il "Registrum prime partis?. Segnature: a10, b8, c8, d8, e8, f6, g8, h8, i8, k8, l10, m8, n8, o8, p8, q10, r8, s8, t10, v8, x8, y8, z8, A8, B8, C8, D8, E10. Si tratta della terza edizione dell'opera principale del frate domenicano Antonino Pierozzi (Firenze, 1389 - 1459), meglio conosciuto come S. Antonino da Firenze. Figlio di un notaio fiorentino e discepolo del cardinale Giovanni Dominici, fu Priore di San Marco, e fu lui a commissionare a al Beato Angelico i sontuosi affreschi che ancora oggi si possono ammirare nel convento fiorentino. Nominato Arcivescovo di Firenze nel 1445, fuggì in Maremma e, ricondotto a forza in città, vi fece ingresso a piedi nudi in segno di umiltà. Fondatore della prima biblioteca pubblica d'Europa, fu strenuo difensore delle istituzioni repubblicane contro le mire accentratrici di Cosimo dei Medici. Lasciò varie opere, che attestano la sua posizione preminente nella vita religiosa del XV secolo. La "Summa Theologica" si compone di quattro parti e vide la luce la prima volta a Norimberga per i tipi di Anton Koberger tra il 1477 e il 1479. Opera di grande diffusione, contò ben venti edizioni complete fino al 1740. L'impressione è opera di Leonardo De Wild di Ratisbona, che già nel 1478 aveva stampato per Nicholas di Francoforte una bibbia latina. Johann Fust and Peter Schoeffer, Mainz, 6 October 1459. 1459 Folio (41 x 29.6 cm). 156 leaves (of 160, without 1, 14 (2/4), 20 (2/10), 27 (3/7) ), 63 lines, double column, gothic type, 3-line Lombard chapter initials printed in red, rubric headings and occasional paragraph-marks printed in red, rubricated and illuminated; four 8-line initials (68r, 82r, 140r, 154v) illuminated in colours and liquid gold with elaborate floral and vegetal borders by the "Fust Master" of Mainz, chapter initials heightened with purple penwork, unprinted chapter initials supplied by the rubricator mostly in blue, paragraph-marks (when not printed) are rubricated in alternating red and blue; lacking leaves all supplied in facsimile on vellum with appropriate illumination which is flaking on leaf 1, the colophon on leaf 160 heavily deleted with photofacsimile mounted below, first illuminated initial with some flaking, border of initial on leaf 154v partially smudged with brown ink, marginal stains on leaf 2, top edge a bit short just shaving the tops of the illuminated initials. Twentieth-century full russet crushed morocco blindstamped in antique style, by Riviere & Son, edges plain; a bit rubbed. FIRST EDITION OF THE FIRST SUBSTANTIAL WRITING BY A KNOWN AND NAMED AUTHOR TO BE PUBLISHED -- THE FOURTH PRINTED BOOK OF SIGNIFICANCE, THE THIRD WITH A FULL DATE. ONE OF ONLY THREE COPIES KNOWN IN PRIVATE HANDS AND ONE OF TEN ONLY ILLUMINATED BY THE FUST MASTER. PRINTED ON VELLUM. Printed by Peter Schoeffer (ca. 1425-1503), Gutenberg's most talented collaborator. 'Johannes Fust was the financial backer of Johannes Gutenberg, the inventor of printing. He gained possession of the printing equipment in a lawsuit [...] in which Schoeffer is named as a witness on Fust's side. While there is no book known naming Gutenberg before or after the break, Fust and Schoeffer continued in partnership until Fust's death in 1466 when Schoeffer, having married Fust's daughter, took over the printing shop alone' (M. Ford, BPH catalogue). Only two other precisely dated books, containing Psalters and also published by Fust and Schoeffer, precede Durandus' work which is the first substantial writing by a known and named author to be published. However, its production was started before the press finished their Bursfeld Psalter of 29 August 1459. Together with the Liturgical Psalter of 14 August 1457 they are the only signed and dated editions in the first decade of printing. The small text type in 'Rationale' represents the first use of this fount, which later reoccurs in various states (and leaded in the 1465-66 Mainz Ciceros); the colophon type is the first manifestation of the so-called 1462 Bible fount. The 'Rationale' was printed almost exclusively on vellum (only one paper copy appears to exist at Munich) and copies were sold in two distinct forms: some with printed initials in red or blue, belonging to the stock of the Psalters; or, as in this copy, with blank spaces for illuminated initials. At four of these places (including the preserved 140r and 154v of this copy), lines of type were reset to create a larger initial-space. No two copies are therefore alike depending on the presence or absence of printed chapter initials, paragraph marks and rubricated elements. Most surviving copies intended for illumination are by the Fust Master, who probably worked at the Fust and Schoeffer printing shop. He was also responsible for illuminating some of the late copies of the 42-line Gutenberg Bible, as well as other works such as Pope Boniface's 1465 'Liber sextus' also included in the present catalogue. Guillaume Durand was one of the most important medieval liturgical writers and one of the principal canonists of his day. Born about 1237, in the Diocese of Béziers, Provence; he died at Rome in 1296. This compendium on the mystical origins and meaning of the liturgies is his most influential work. Written in 1286 its eight books contain a detailed account of the laws ceremonies, customs, and mystical interpretation of the Roman Rite. Of great rarity: only two other copies in private hands are known, one of which is not illuminated. Not in H.P.Kraus' catalogue 'The Cradle of Printing' part I and II. HR 6471; GW 9101; BMC I, 20; Goff D-403; ISTC id00403000; on the illuminator see E. König, "Für Johannes Fust," Festgabe Corsten, pp. 285-313. Butricis Papiensis impressa...ANTONINUS Florentinus, S. (Frate Antonio Pierozzi, O.P., 1389-1459). Venetiis, Anno dni. 1492 die 23 zenaro. In-4° (mm 200 x 150), cartonatura settecentesca. (100) ff. (manca a1 col titolo) segn. a10, b18, m10, 2 coll., 43 ll. Car. gotico. Alcune postille a penna di antica mano. Esemplare ben conservato. L' autore frate domenicano, casuista e cronista, fu dal 1445 Arcivescovo di Firenze, canonizzato nel 1523. Edizione molto rara (2 sole copie in U.S.A.). H.(C) 1200a. Reichling, fasc. IV, p. 112-13. Proctor, 5359 A. B.M.C. V, p. 502 (copia mancante del titolo e di altri 2 ff.). G.W., 2133. I.G.I., 649. Goff, A-826. [Mainz: Johann Fust and Peter Schoeffer, 1459. From the FIRST EDITION. A Vellum Leaf Printed in 1459, from theVery Rare First Extant Non-Liturgical Book. 419 x 308 mm (16 1/2 x 12 1/8"). Double column, 63 lines of text in gothic type. From the FIRST EDITION. Attractively matted. Paragraph marks in red, capitals struck with red. With some old (but not contemporaneous) inscriptions (mostly in blank margins). Goff D-403; BMC I, 20. Formerly part of a binding and so with most of one side a little browned and with traces of glue on the same side, a dozen tiny punctures (one affecting two letters on each side, the others either one letter or no text), faint folds reflecting the leaf&#39;s use as a binding liner, but still AN EXCELLENT SPECIMEN, the text entirely legible, and with one side particularly bright and clean, especially given that it is a recovered leaf. This is a leaf taken from a very rare book of great importance in the history of typography. Duranti&#39;s "Rationale" is the fourth extant printed book and the third dated book, preceded only by the Gutenberg Bible (ca. 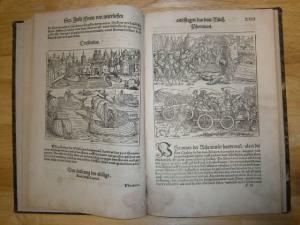 1455) and two Latin Psalters printed by Fust and Schoeffer in 1457 and 1459. It is also the first book to be printed in a text type, the three earlier ones all being in gothic liturgical typefaces. Duranti, bishop of Mende (ca. 1230-96) was an active and highly successful churchman, a distinguished canonist and liturgist, and a person who also played an important role in the governance of the papal territories in Italy. The most complete Medieval treatise of its kind, his "Rationale" is an erudite compendium and a principal source for the history of the liturgy of the Western church. It deals with church buildings and furnishings, the Mass, the sacraments, and the Office as well as the temporal and sanctoral cycles of the ecclesiastical year, with great attention to the symbolic and mystical significance of these matters. Johann Fust (ca. 1400-66), a goldsmith, provided financial backing to Gutenberg while the latter was perfecting his new printing process. When Gutenberg was unable to repay the debt, Fust sued and was awarded Gutenberg&#39;;s equipment. Fust went into business with Peter Schoeffer (ca. 1425-1503), Gutenberg&#39;;s principal assistant, and theirs became the first commercially successful printing company. Schoeffer married Fust&#39;;s only daughter, and trained their sons as printers (his son Peter printed the first edition of Tyndale&#39;;s English New Testament). The elder Schoeffer is credited with introducing the printer&#39;;s device and with developing the basic techniques of punchcutting and type-founding. The text here is printed in Schoeffer&#39;;s "Durandus" type, a gothic-roman typeface combining elements of rotunda with the stylistic features of Italian humanist handwriting. This book is quite rare: since 1975, ABPC lists just one complete copy, two copies lacking four leaves, and two single leaves (both recovered leaves on vellum). Recovered leaves typically have text trimmed off and often illegible text, but ours has extremely ample margins, and everything is very readable. Mueller and Schindler. New. Hardcover. <p>The "first German bibliophile book"</p><p>The Theuerdank from the dispensary of Augsburgers Hans Schönsperger, appointed by Maximilian the imperial printers for life, is one of the most important works-German Renais-sancekunst. The masterful woodcut illustrations by Hans Burgk Maier, Hans Leonhard Schäufelein, Leonhard Beck and several other artists as well as the specially made typeface justify the imperial glory of this work as "the first German bibliophile book". </p> <p>Maximilian I, the "last knight"</p><p>Maximilian I (1459-1519) was one of the most important rulers of the transition from the Middle Ages to modern times. He is also the preserver of medieval traditions such as the sovereign who attempted to create through political and economic reforms, the basis for a comprehensive centralized imperial order. His fondness for glittering court life, hunting and jousting matches earned him the nickname "the last knight &#39;. His strong need for recognition and representation was reflected among other things in support of such art and literature. Posterity should therefore remain an authentic picture of the emperor. </p> <p>The eventful journey of the bride knight Theuerdank</p><p>The epic poem is one of the earliest German autobiographical novels key. It describes in allegorical form, the bridal procession of Maximilian I to Mary of Burgundy, the beautiful daughter of Charles the Bold. Numerous adventure and overcoming mysterious adversary form the content of this exciting work. With God&#39;s help and thanks knightly virtues of the hero finally wins the beloved bride. With this epic Maximilian I wanted to give his life a meaning interpretation, so each chapter is indicative of the spirit of the world "last knight". Especially hunting and tournament passion Maximilian found in new experiences reflected. </p> .